Put chopped onion, coriander leaves, mint leaves, green chilli, ginger and garlic in a blending jar. Add little water (1/4 cup) and blend it into smooth paste. Prick the boiled eggs with knife and cut the boiled potatoes into two pieces each. Add little turmeric powder, red chilli powder, salt in the eggs and potatoes, mix it properly. Heat little oil in a pan and shallow fry the eggs and potatoes for 2 minutes on medium flame. Take out the fried eggs and fried potatoes from the pan, keep it aside for further use. Add 1 tsp ghee, mix it and cover the pan, boil the rice on high flame until it is 70% cooked. Heat oil in a pan, add remaining whole spices and green chilli, fry it for 20-30 seconds. Cook it for 2-3 minutes on medium flame, keep stirring in between. 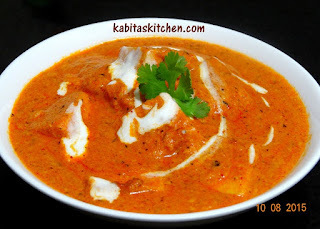 Reduce the flame to low and add curd into the masala(whisk the curd before use), keep stirring. 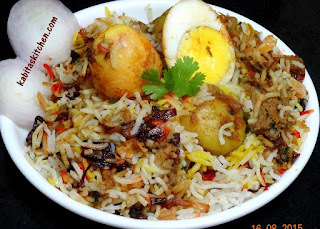 Add shahi biryani masala and mix it, cover the pan and cook it for 3-4 minutes on low flame, turn off the flame. Take a deep and thick bottom pan, put the cooked masala paste on the base of the pan. Add 1 tsp ghee, half of the fried onions, fried eggs and potatoes on the masala paste. 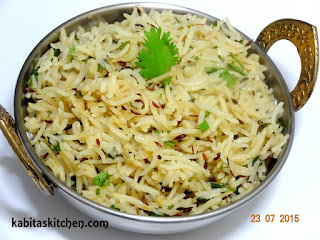 Put all the rice on it and spread it evenly, add 2 tsp of ghee on rice. Add saffron soaked milk on half of the rice and 1 tsp food colour on remaining half. Sprinkle remaining fried onions, coriander leaves, mint leaves on top of the rice. Note: You may add kewra water and rose water for restaurant style aroma. Turn on the flame and put the biryani pot on it, cook it on medium flame for 6-7 minutes. In the meanwhile turn on the other burner of gas and heat a tawa. Shift the biryani pot on tawa after 6-7 minutes of cooking on direct flame. Cook it on tawa for 10 minutes on medium flame, turn off the flame. Wash the okra with water and wipe it with kitchen towel. Trim the top and tail of the okra, cut it into two equal parts, slice these parts into thin strips and remove the seeds. 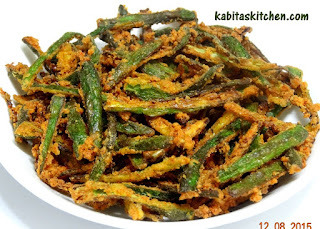 Put all the chopped okra in a big bowl, add gram flour, rice flour, carom seeds, turmeric powder, aamchur powder, red chilli powder, cumin powder and mix it properly with okra. Add the salt just before frying and mix it properly. Heat sufficient oil in pan, put one okra in the hot oil to check the temperature of oil. Once the okra starts floating on the oil, it means oil is perfectly hot for frying. Put small portion of spice mixed okra in the hot oil and fry it. Fry the okra on medium-high flame for 2-3 minutes or till it turns golden and crispy. Repeat the same process for remaining spice mixed okra. Turn on the flame, heat a pressure cooker pan. Add cooking oil and let the oil heat. Add asafoetida, cinnamon stick, bay leaves, cumin seeds and fry it for few seconds. Add green chilli, garlic and ginger and fry it for 1/2 minute on medium flame. Add chopped onion, Fry the onions till it turns soft . Add chopped tomato, Fry the tomato for 2 minutes on medium flame. Add chopped spinach, cook the spinach on medium flame for 2-3 minutes. Add turmeric powder, red chilli powder, salt and Mix it. Add washed lentil, Mix it, fry the lentil (dal) for 2 minutes. Add 2 glass of water and salt, stir it. Add garam masala powder, Stir it. Close the lid and boil it for 3 whistle on medium flame. After 3 whistle, turn off the flame and let the pressure cooker cool down. Open the cooker, stir it well. Turn on the flame and heat a pan, add 1 tbsp of butter and let it melt. Add cinnamon stick, green chilli(optional), garlic, ginger and fry it for 30-40 seconds on medium flame. Add chopped tomato, fry the tomato for a minute on high flame. Turn off the flame and allow the fried tomato to cool down. Put the fried ingredients in a blending jar and blend it into thick smooth paste (do not add water). Stain the tomato puree and keep it aside for further use. Put the soaked cashew into the blending jar, add 4-5 tbsp of water and blend it into paste and keep it aside. Heat the same pan again, add butter and let it melt. Add kashmiri red chilli powder in the melted butter and fry it for 10-15 seconds, keep stirring. Add the stained puree, stir it and let it come to boil on high flame. Add coriander powder, mix it and cover the pan, cook it for 2 minutes on medium flame. Add cashew paste, mix it and cover the pan, cook it for a minute on low flame. Add 1/4 glass of water, salt to taste and gently stir it. Add 1 tbsp of fresh cream and mix it in the gravy. Add paneer, stir it and cover the pan, cook it for 2 minutes on low flame. Add garam masala powder, mix it and cook it for a minute on low flame without cover. Roast the fenugree leaves on other stove for 1/2 minute on medium flame. Rub the roasted fenugreek leaves on your palm and gently sprinkle it on paneer butter masala, mix it. Add 1 tsp butter in the paneer, cook it for a minute on low flame and turn off the flame. Note: Panner butter masala is usually a little sweet in taste, do not add green chilli if you like it to be sweet. Decorate with almonds and serve. Heat cooking oil in a pan (let the oil heat properly). 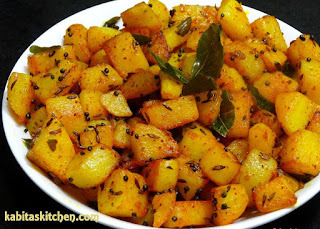 Add cumin seeds, mustard seeds and curry leaves, fry it for few seconds. Add chopped potato and fry it for 2 minutes on high flame. Add turmeric powder, red chilli powder and salt to taste, mix it well. Cover the pan and cook it for 2-3 minutes on medium-high flame. Open the lid, Stir it and cook it for 4-6 minutes on low-medium flame(Cover the pan and ). Cover the pan and cook it for 2-3 minutes on low flame. Check if potatoes are cooked properly, if not, then cook it for 2-3 minutes more on low flame (cover the pan). Turn of the flame, ready to serve with roti, puri or paratha etc. Put the chopped dates in the grinding jar and coarsely grind it (do not add water). Turn on the flame and put a pan on it, add poppy seeds and roast it for 2 minutes on low-medium flame. Take out the roasted poppy seeds in a plate, keep it aside for further use. Add ghee in the same pan, add edible Gum (gond) and fry it for 2 minutes on medium flame. Take out the fried gums in a bowl/plate and keep it aside for further use. Add the chopped dry fruits in the pan and roast it for 2 minutes on low-medium flame. 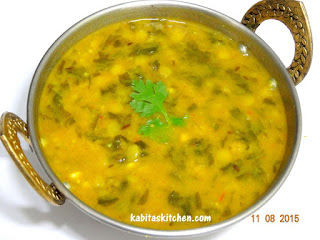 Take it out in a bowl and add the remaining ghee in the same pan. Add grounded dates and roasted nuts in the pan, mix it together. Fry it for 3-4 minutes on low-medium flame, keep stirring. Turn off the flame, let it cool down a bit (leave it for 3-4 minutes). 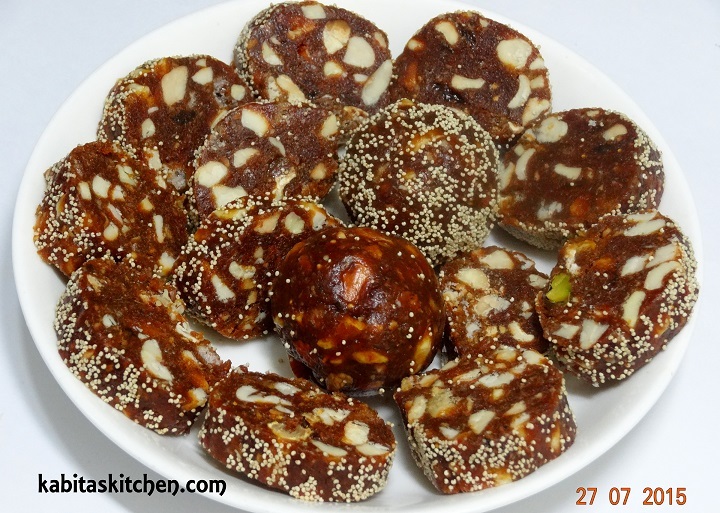 Mash the fried edible gums with hand and mix it with prepared date and nuts mixture. Grease your palm with ghee, take a small portion of mixture and make a Laddoo (small ball). Roll the ball into roasted poppy seeds to coat the Laddoo with poppy seeds. 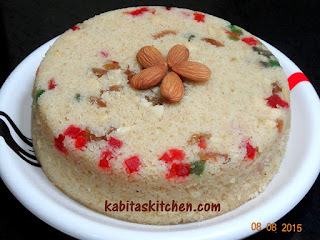 Make all the Laddoos like this or you may give it shape of your choice. Take half of the mixture, roll it in cylindrical shape, coat it with poppy seeds and wrap it with foil paper. Keep this roll into the refrigerator for 1 hour to set. Take out the roll from the refrigerator, remove the foil paper and cut it into slices. Date and nut barfi/rolls are ready, store it in air tight container and consume it for up to 3 weeks. Turn on the flame, heat a pan. Add ghee/oil in the pan and let it heat. Add cinnamon stick, cardamom, dry red chilli and bay leaves, fry it for few seconds. Add cumin seeds, fry it for 10-15 seconds on medium flame. Add washed rice, water (1 and 3/4 glass) and 1/2 tsp of salt, stir it. Cover the pan and cook it on high flame till it starts boiling. Once the rice starts boiling, reduce the flame to medium flame and cook it for another 7-8 minutes (partially cover the pan). Reduce the flame to low, stir it and cover half of the pan and cook it for 2-3 minutes more. Turn off the flame, cover the pan and leave the rice covered for 8-10 minutes. Ready to serve with dal tadka, dal fry or any curry.